I saw this room in a real estate listing, and thought it was really beautiful...full of light, very neutral, and so serene. I would guess that no children live in this house! The canvas above the fireplace is interesting. I would love to see it in person, because from the picture it looks like a canvas painted white, and nothing else! I am not sure what makes this room so striking to me. I love the branches/flowers above the fireplace, and the monochromatic nature of the room, punctuated by colorful pillows, throws, and benches. I like all of the lamps in the room, and the chest on the left, the consoles on the right with the series of framed items above them. I love the contrast of the black chest with the cream room. The room even has a trendy lucite side table by the sofa! ahahahah! 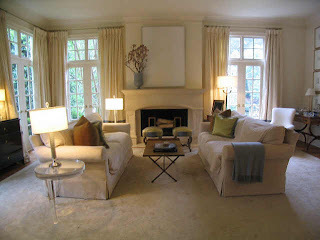 We've come a long way baby - this is her living room exactly from the magazine! the stools are now by the fireplace. Do you have the other photos from the house - I would love to see them.